A lovely balance of comfort and sound quality creates headphones that can help craft great mixes. The open back ATH-R70x has a unique design feature: a pair of sprung wing supports instead of a continuous padded headband. This has two advantages. First they cover less of the head and, if you run a little hot like us, this is a good thing. Second, coupling between sides is minimised, which is key to good stereo separation. The R70x are so light it is easy to forget you have them on, a sensation augmented by the open back design which keeps you 'in the room'. It is overall a less unnatural experience than with chunky closed backs, and this helps limit fatigue. The cable is dual-sided and is designed to maintain left-right orientation whichever way you plug them in - you just have to be wearing the headphones the right way. The 3m cable is of the straight variety, which for us often ends up under the castors of our studio chair, and oddly there is no coiled alternative supplied. 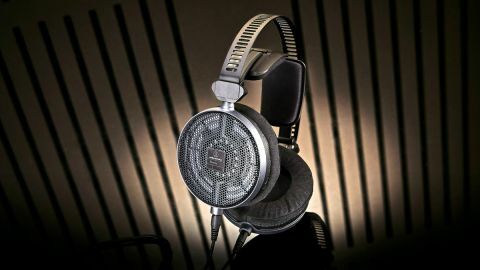 The R70x are the first Audio-Technica headphones we have truly enjoyed, as well as being the most comfortable we've tried by any manufacturer. Switching between them and our main monitors has proven to be one of the least jarring experiences we've had (in this regard, not in our life, that would be odd! ), with the only shift being in the high-end, where the R70x are slightly less forward. These are smooth sounding headphones across the whole range: no humps or bumps, no hyping, no harshness, just clarity and detail. The response is in no way soft and they can lay bare sibilance, resonance and splashy mix elements (over-hyped pads, over-exciter'ed acoustic guitars, etc). At this price and above we've used models with more apparent 'air', but we don't consider this a deficiency, and it means there's no settling for a dull mix. Down the other end the response is no less smooth with all the extension you need without the slightest hint of boom or false fatness. Moving up, the low mids continue unwrinkled, free from cheap scooping back (a voicing often employed to mask uneven response) so you can really hear what's going on, for better or for worse. It's all about the mids and low mids for us, and with the R70x all the juice comes through without complications; everything appears clearly delineated and unmuddled, unless the source is otherwise. We easily spotted an over-resonant tom in a recently completed mix which we were able to adjust with little fuss, polishing the mix off effortlessly. We always end up banging on about the mids as this is where the majority of vital information sits in a mix, and space is at a premium. The clear articulation of the R70x makes it easy to place reverbs and EQ elements forward and back, while distortion and compression artefacts from low-end sources are easy to catch and control. The excellent Left-Right decoupling in conjunction with the quality of frequency response helps create and maintain a full width stereo image, allowing for confident pan decisions and the construction of complex sound fields, as well as extreme ones. Any phase correlation problems are also a cinch to identify. Power-wise the R70x have more than enough handling and remain clear and crisp up to the maximum level we were prepared to drive them to. Headphones with great performance can be bought for almost half the RRP of the ATH-R70x, but they just won't be as good, and nowhere near as light and comfy. To find any real rivals you'll have to shell out well over £300. We cannot speak for mastering as it's not our field, but for mixing and tracking reference (in a quiet space!) these are ideal headphones for whatever material you throw at them. If you're after a high-quality pair for listening to your hi-fi we would also heartily recommend these; we lost a serious chunk of a morning just listening on the R70x, revelling in great mixes.